Shweta is an ex-student of ACCLA, who enrolled herself in the first batch. In fact, she was the only female student in that batch. Shweta is a true example of the power of a woman’s inner strength, determination, hard work and drive for excellence. Shweta graduated college from Goa and worked as an Asst. Accountant for 4 years. She had lived and worked in Kuwait for a long time after marriage, before she returned to Goa. She received a mailer one day, from ACCLA inviting her to attend a seminar at the campus and decided to try it out. At the seminar, she discovered the opportunities that lay in working for a Cruise Line. A mother of a 6-year old daughter, Shweta completed the ICCP course at ACCLA, and landed her first contract on the cruise soon after and is back home on vacation, till she leaves in a couple of months again for her next contract. Shweta had a lot odds against her.. she had the responsibility of her child and thanks to the tremendous support of her husband, she took up the challenge to join the cruise line. Today she shares her experiences with us. She was also the only Indian woman to be working in the galley of an international brand, although there were a few other women there as well. 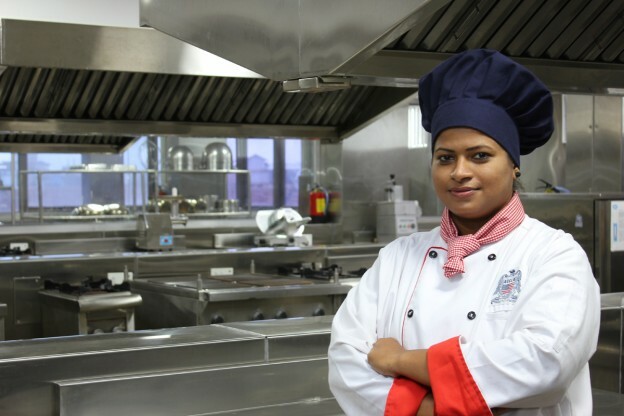 Shweta was inspired by the life one could have working on a cruise ship. She knew she had to work hard to get there and she did. She did not have prior experience in this field and it seemed to be a new world to her altogether. But she was determined and she knew what she had to do in order to get there. She wanted to excel so she put in all her efforts to understand the business and pay very close attention to what was being taught by the faculty. She told us how much the curriculum and tips given by Chefs at ACCLA help, especially on the work culture and skills required. She completed the course and started the IT training at one of the 5-star hotels. It was quite challenging for her as she never worked with such pressure. Keeping the bigger picture in mind, Shweta adapted to her environment gradually and learnt many things there. Till now she had excelled in her course and IT Training at the hotel. Shweta successfully cleared her interview with a Cruise Line in her first attempt and was off to the start of marvellous journey. It would not be easy leaving a family behind for a long time, especially her very young child… Its never easy for a mother to leave her child for more than a day! When she reached the port she was amazed at the place she would be calling home for the next 8 months, and better still, were the people she would work with and call her family for the next 8 months. Life on board was not that easy at all initially. Shweta suffered sea sickness for at least a month where she was on daily medication for it. But she soon realised that such a prolonged period of medication isn’t a good thing. So she kept off the meds and decided to ride it out to see what would happen. With sheer determination and lots of faith, Shweta overcame the issue with sea sickness and was back to normal to put in her usual 100% in her job. Shweta has enjoyed her last 8 month on board, albeit, she missed her family very much, however, she kept in touch with them via video conferencing on the internet. She made a whole lot of new friends, travelled to different places around the world, and visited the Vatican (one of my personal favourites! ), she was exposed to so many different cultures which is truly an eye opener and which makes our world more connected. It truly has been an adventure for her. She thanks her faculty and staff of ACCLA for the opportunity and the for getting her truly ready for a wonderful career she enjoys and her personal message to all is ‘Safety First’, and more importantly….. TRUST YOURSELF!! This entry was posted in Success Stories on May 4, 2016 by admin.